The LVR-7815 is the first of a family of positive linear voltage regulators offered by DATEL that have guaranteed performance from -55 to +125ÂºC. It is your best choice for all military, aerospace, harsh, and demanding applications. 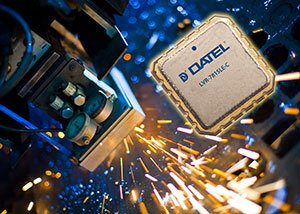 DATEL, Inc. announces the introduction of the LVR-7815 series, a new line of Linear Voltage Regulators that can deliver over 0.5 amps of output power. The LVR-7815 is housed in a hermetically sealed ceramic package that makes it impervious to humidity and the perfect choice to be used in applications where humidity is a concern. The LVR-7815 is a 15 Volts positive fixed voltage regulator. Each unit is 100 percent tested for all grades and across one of three standard temperature ranges: 0 to +70°C; -40 to +100°C; -55 to +125°C. All protective features are designed into the circuit including thermal shutdown, current limiting, and safeï¿½area control. The LVR-7815 regulators are internally trimmed to provide a nominal voltage accuracy of 1%. Other output voltages, ranging from +1.8V, +2.4V, +5V, are also available. All the LVR-7815 grades are manufactured on the same production line at DATEL's USA facility, which is certified to MIL-PRF-38534 standards. The device is available in a commercial version as well as military versions. RoHS and non-RoHS configurations are available.